Mystic Waters in Des Plaines is a welcome and fun close-by amenity for Lexington Park homeowners, especially on sweltering summer days! Mystic Waters is one of the largest and most beautiful waterparks in Northern Illinois and is a favorite destination for families throughout Chicagoland. If you’re looking for fun for kids of all ages, parents and adults, this is the place to be as the summer season begins! This popular Family Aquatic Center opened Saturday, June 4, and its pre-season extends through Friday, June 10, from noon to 7 pm. Regular season hours for all three Des Plaines Park District pools begin on Saturday, June 11. 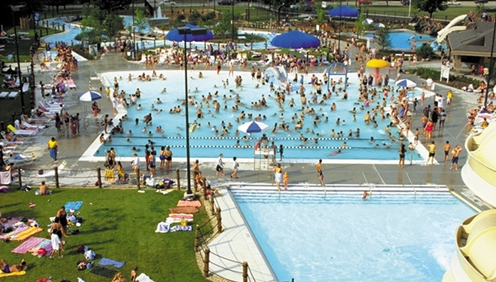 Mystic Waters opens daily at 11am; Chippewa and Iroquois Pools open at noon. Pool passes are on sale at Mystic Waters beginning on June 4, Monday to Sunday from 11am to 4 pm. Don’t wait to get your passes for the whole family. When the sun is hot and the days are long, pool time with loved ones is exactly what you’ll crave. Mystic Waters Family Aquatic Center is located at 2025 Miner Street. For more information, call 847-391-5700.